Answers Can you print my photo? 1. Pick a photo from your computer, tablet, or smartphone. 2. 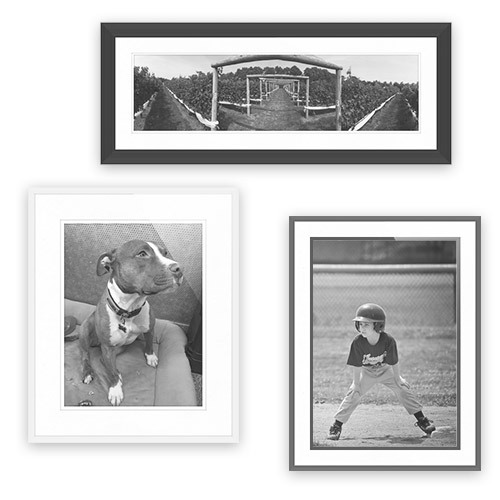 Choose what size you want your photo printed, from a small table-top frame to a large poster. 3. Pick your favorite of our many frame and mat board styles and colors. You'll see a preview of what your frame will look like. 4. We'll print your photo in the size you picked using a professional-grade large format printer, and then build the frame you designed to the exact size of the photo. Because we can build any size frame, we don't need to crop any of the detail from your photo. Each frame is built using 100% premium American-made materials and comes fully assembled with everything you need to hang it on your wall - no need to buy any additional accessories.